Make the cake according to the package instructions, substituting Baileys for the water in the recipe. For the frosting, cream the butter, sugar, and peanut butter together. Add the remaining ingredients and beat for 3 minutes until creamy. From Halloween through New Year’s, nothing gives me more comfort than a nice cold bottle of Irish Creme Liquor. It brings back sweet memories of my whole family gathered around my grandfather on Christmas Eve, singing songs and laughing until the early morning hours. As the weather gets colder, I search for excuses to sneak the creamy alcohol into various different desserts, cocktails, and even savory dishes! It tastes the best in desserts though. 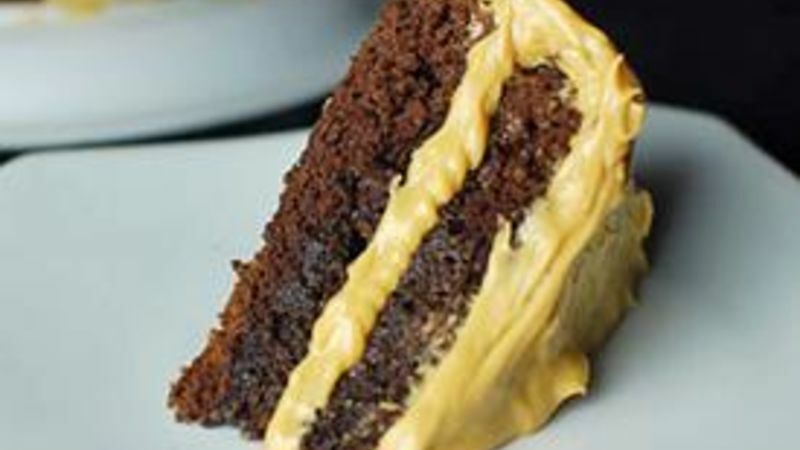 Like this Baileys Chocolate Cake with Peanut Butter Frosting. My roommate took this cake to work with him…and almost got attacked in the hallway for every last slice! Just make your cake according to the box instructions, but replace the water with Baileys. As the cake is baking, make your frosting. First, mix peanut butter, butter, and powdered sugar. Then pour in some heavy cream and vanilla. After the cake cools, load on the icing. Yum! Dan Whalen could win over any workplace with chocolate and peanut butter. He has been blogging for over 4 years at The Food in my Beard; check Dan's Tablespoon profile often to try his recipes with creative international spins!